A few days ago good pal of mine got in touch with me. I could sense his excitement, he knew he was in the money. 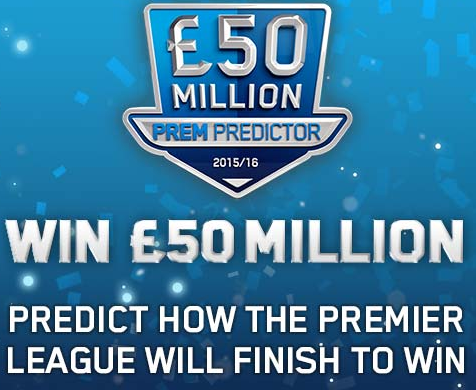 William Hill are offering a prize of £50 million, for a £2 stake, if you can correctly predict how the Premier League will finish. I’m thinking to put the top 6 or 7 the same in each, as well as the bottom 4 or 5, and then varying for those in the middle, can you give me an idea how many teams I’d need to be sure of to give me some leeway in mid table? … he asked. He figured he could predict the top and bottom of the table with some certainty, and was planning on making about 50 entries to cover the different permutations for the middle of the table, netting him a return of £50 million on his £100 investment. The generous chap that he is, I’m sure he would remember me – his adviser – when he scooped his fortune. I had to break it to him gently. As I wrote in this post, there are a staggeringly large number of ways that the twenty teams could finish the season. But my friend is smart, and by fixing the top and the bottom of the league his chances of winning improve enormously – let’s face it, whatever happens, Chelsea aren’t going to get relegated and Bournemouth won’t win the tittle. To keep the numbers simple, I suggested we fix the top six and the bottom four, leaving ten teams to be arranged in mid-table. How many ways of doing this are there? Alas, more than 3.5 million. (10 x 9 x 8 x … x2 x 1, or 10!) so he was unlikely to “get lucky” with one of his fifty selections. How many teams must I lock down to cover all combinations with my fifty choices? Locking down 15 teams, leaving 5 to be arranged, gives rise to 120 (5x4x3x2x1 or 5!) permutations, locking down 16 teams, leaving 4 to be moved around gives rise to 24 (4x3x2x1 or 4!) different possible outcomes. The numbers are not on his side! You won’t beat the bookies – that’s about the only safe bet I can recommend.